A 9 course repast in Meredith's -put the on the ultimate top of the 50 best food experiences in Auckland by the country's premier newspaper not long ago- was in the offing. This time, I jettisoned all my dietary restrictions, settled into an empty restaurant that rapidly filled up,and nodded to the Chef at the counter. The first formal offer was King Salmon, ricotta and roe. Michael Meredith knows as well as any other top chef in the world about chopping up Sashimi-grade fish, and setting it to float amidst whispers of gentle savouriness, some cream and textural zing. It is reasonably good to eat, but it has limited gustatory impact. Second gear top-lined Northland Paua: chewy and feebly flavoured, these were not a patch on the spectacular fried beignets tasted in the otherwise mediocre Quay of Whakatane. The unexpected tour de force on the plate were two Shitake mushrooms which possessed mind-smashingly seductive smokiness. My hostess Tamarra was a keen gentle presence, and she'd ritually say "And here we are..." when presenting a dish, her exceedingly light voice reciting the dish's constituents like a feather tossing to and fro in the wind - you couldn't quite catch its drift. Chef Meredith worked away in an exposed kitchen rectangle that showed his placid finesse but edited out the handiwork and plating below. Young, handsome, avec a french beard and casually attired with a smooth-punk mien that would make one not totally reject the possibility of him flicking a blade in a back-alley, he makes sure here that the knife is used for much nobler effects. But that skilled handiwork did not yield much joy when it densely designed a rectangle of Venison, Smoked Eel and horseradish which made the last component assume an unwelcome touch, and pleasure was further precluded by the dish's briny,cured notes. Last year I had the privilege of eating outstandingly soft and flavourful duck in a cafe on upper Symonds street, and one suspects that some members of this fine brood escaped from there and were caught by the time they had trudged up to mid-Dominion road. This explains why this fowl here was still reasonably soft but betrayed a tiredness of spirit. Further unkindness was shown to it by prickly fried kale sprinkled all around, and a Medjool date didn't realize that the situation called for consolation, not cloy. A meaty incarnation of clarified butter then appeared in the form of pork belly- the crucial element of pure savouriness, even a bit of smoke which is salubrious to the sucess of this dish was missing. Charred eggplant puree- a current favorite of Meredith's -was the lone sage counsel on the plate but other sweet elements again high-jacked maturity. The place is famous enough to attract locals and overseas visitors alike- a lovely French lady in the the adjacent table conversed with me - ideal restaurant spacing shoudn't allow this but apparently Meredith's has liberal ideas of social networking. 3 duds in a row made me forlornly wonder why I subject myself to these protracted 9 course affairs trotted out by precious kitchens that may flatter to deceive. Brooding minutes trickled by and I was floating in an ocean of culinary dysphoria when Chef M suddenly broke surface and emerged from the depths with a stunning specimen from the waters- a broadbill that possessed remarkable discipline in texture and yet a splendid softness. MM also upped the ante by a beautiful presentation that placed the white marine fillet at the center of a orange sea and he crowned this alabaster oasis with almond chutney and sliced nuts. The failing carriage had by this time morphed into a Maybach and the kitchen capitalized by smoothly "Poussin" the accelerator ( this "P" word is pronounced differently) I was spellbound by the sheer tendresse of this young chicken- the main boned offering possessed magnificent depth of taste, the two slices of breast again afforded deeply satisfying succulence,while a carrot and cumin puree delicately evoked the hearty fragrance of a makhni sauce. Over the course of more than 3 hours, I noticed that the restaurant needs at least one more server if it is to reach truly world-class standards.The ambience passes muster for a haute joint- an arrangement of black, white and glowing amber in a compact space with closely set tables.The first dessert that set off rich notes of feijoa, rhubarb and apricot against a yoghurt cloud failed to impress but the next one lifted the final memorable sail of this 9 course odyssey.Pristine pineapple ice-cream was planted next to petite domes of exquisite caramel cream, while thin slices of pineapple and its wafers framed the dish into haute chambers. The exotic beast in this mix was Jerusalem Artichoke, cooked to springy texture, and blanketed in the piquant sweetness of licorice- showing a kind of a kind of audacity that transcends logic. Chef Meredith is no doubt highly talented with smooth executive ability and some his dishes (I've till now tasted 18 of them) give profound joy. But he needs to eschew the tilt towards sweet tastes that afflict many of his compositions. A stricter focus towards accentuating the main component of the dish would be a crucial change, rather than bringing in the entire orchestra, restraining their effect and ultimately producing middling symphonies. I will only visit this restaurant sometime next year or even further and hopefully by that juncture, this place might have acquired a truly exceptional soul. 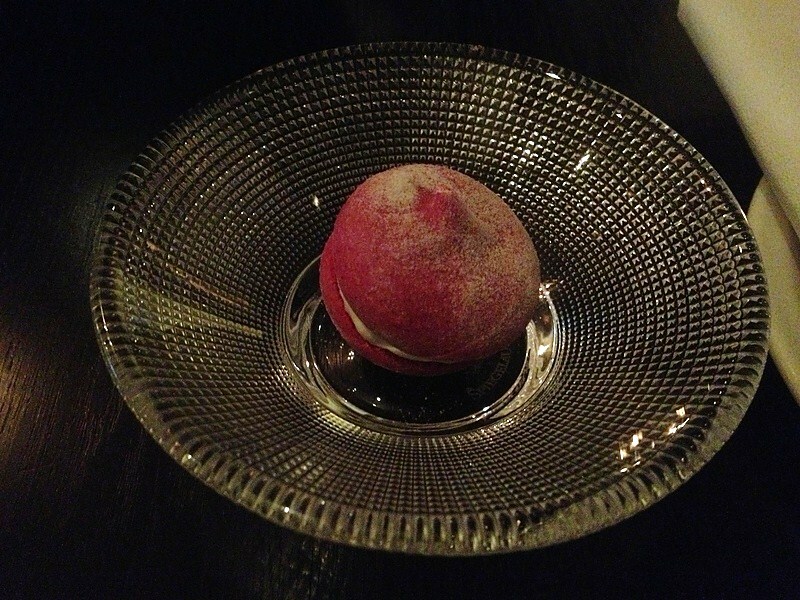 Meredith's Signature Beet and foie gras Macaroon - so subtle that it's gone before you know it. A much-anticipated return to this restaurant was occasioned for me by an evening of food and wine charmingly chaired by the patrician delightful presence of Mark Belsham , of Foxes Island wine estate. As a young lady at our table insightfully observed, Meredith inverted the menu sequence by serving oyster ice cream first, and a slightly savoury cheese course as the finisher - that first dish by the way is the most creative I've had in this joint - the upper "shell" of the oyster is actually meltingly soft - it is the ice-cream itself cunningly topped by gray-black sheen - the flavour was a total beaut - a disciplined exquisite distillation of chilled seashore. None of the remaining five dishes measured up though a duck main was very serviceable with moreish parsnip topped by its powdered essence and a simply superb slice of creamy faintly smoky boudin noir (the only time ever that I've liked the latter). An early offering was very soothing but not especially gratifying - crab , avocado and white peach gave creaminess and refreshment while a welcome counter-note issued from softly woody twinkles of macadamia and wheat. None of the service staff I encountered were those known from my earlier visits - the current ones are nice but not top-notch. Overall Meredith's remains a good fine-dining restaurant but it is still not world-class. PS : NZ Herald's Twelve Questions interview, freely available online, presents an untramelled look at how thorny and challenging Michael Meredith's life has been.